How much control do we have over the choices we make? That was a central question asked in a 2008 Radiolab episode. 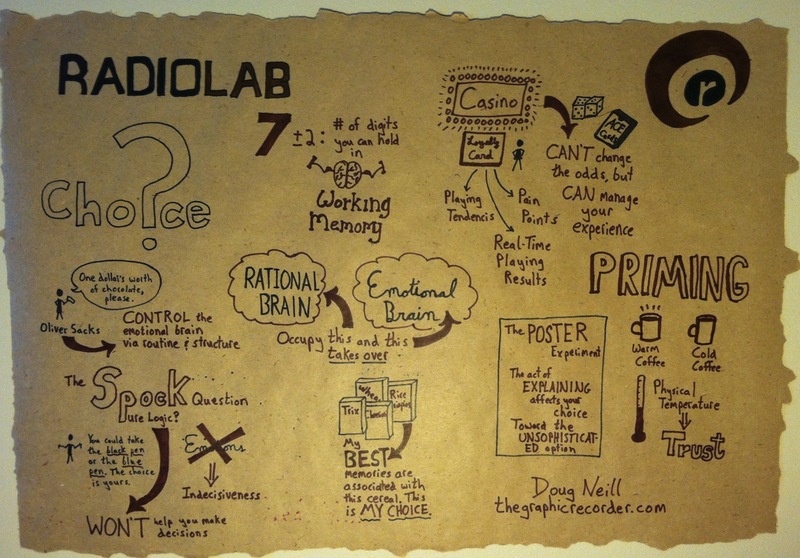 While revisiting that episode this week, I captured some of the ideas in the real-time graphic recording seen above (you can click on the image to view a larger version). Of particular interest to me is The Spock Question: Can we really make better decisions if we use pure logic and put all emotions aside? Turns out the answer is a definitive ‘No.’ Without the aid of emotions, our brain gets lost in the inherent complexity of even the simplest decision. Too many factors are in play for our brain to be able to think logically through all of the consequences of our decision. So at some point we have to rely on our emotions to help us: we choose what feels right. In the past I have tended to be an over thinker, but lately I have been trying to be more aware of my emotions and use those emotions as indicators of what changes need to be made in my life.